Darling is a little village about 75 km north of Cape Town and a perfect weekend getaway town as a result. 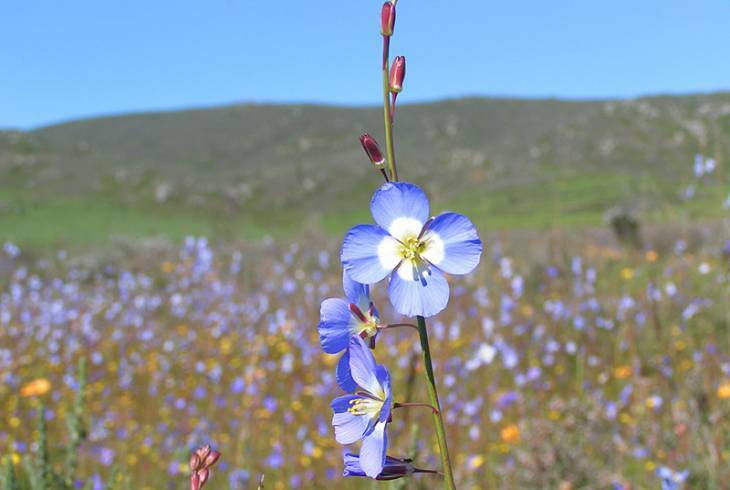 Darling lies within the Cape West Coast Biosphere reserve and is synonymous with the annual wild flowers that turn the surrounding countryside into a rich tapestry of colour during spring of every year. Darling has hosted a flower show every year since 1917. The streets are lined with lovingly restored Victorian homes and old trees and a number of artists have settled here. Darling has earned a place in every South African's heart as the home of the famous Evita Bezuidenhout (Pieter Dirk Uys) - non-PC superstar, the most famous white woman in South Africa and best babotie maker to boot! Visiting Evita se Peron at the Darling station is an obligation when in Darling. Darling is in the middle of a new discovery area of modern Cape Wines and some of these have already achieved critical acclaim, including Alexanderfontein, Groote Post and Darling Cellars - which you can visit for wine tasting. Darling overview. Darling Accommodation and Information.